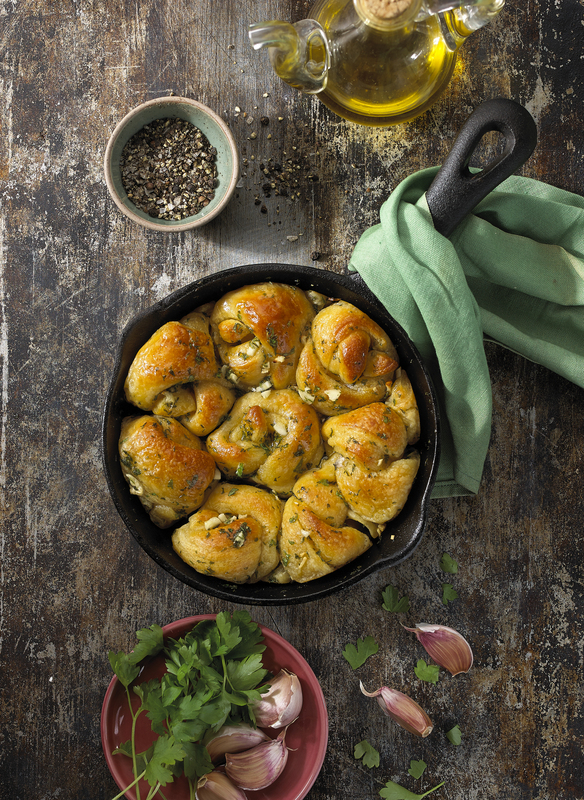 Skillet Garlic Knots | Flavor Your Life. Gently warm extra virgin olive oil, butter, and garlic in a small saucepan. Add chopped parsley and stir. When the garlic is soft, pour out into a bowl and set aside. Roll out the dough on a cutting board. Cut in half lengthwise and then slice in the other direction into ¾" strips. Tie the dough strips into knots. Loop a strip of dough and then take one end over and through the loop. Arrange in the same iron skillet, so that the knots are touching each other. Pour the olive oil/garlic mixture over the knots and sprinkle each knot with a pinch of sea salt. Put in oven. Bake for approximately 12-15 minutes or until golden brown. Best served warm, but still good when at room temperature. Can serve with a warm tomato sauce for dipping.